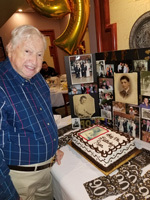 Dr. Lowell Ressler, 90, of West Bloomfield, Michigan, died on 07 February 2019. The Funeral was held at The Davidson/Hermelin Chapel at Clover Hill Park on Sunday, 10 February 2019 at 9:30 AM . Rabbi Harold Loss and Cantor Neil Michaels officiated.